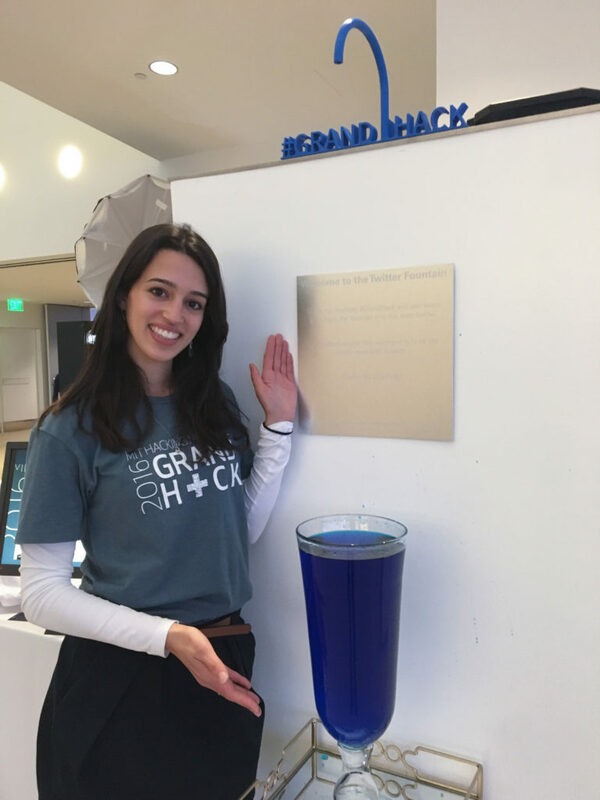 I came up with the idea of a Twitter Fountain in 2014 for the world’s first Grand Hack, the largest health hackathon in the world at the time. 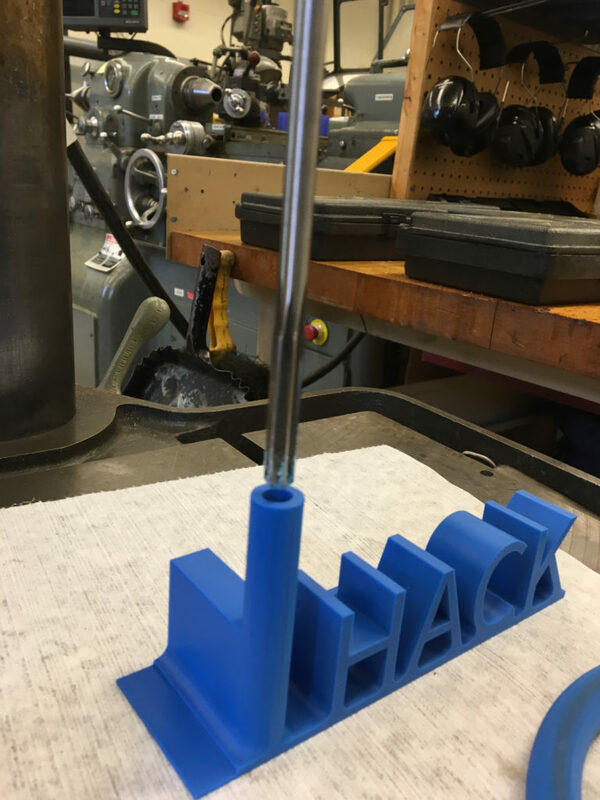 As an organizer for the event (learn more about MIT Hacking Medicine here), I was sad that I wouldn’t get to “hack” and build things during the weekend so I decided to do a hack for the event instead. 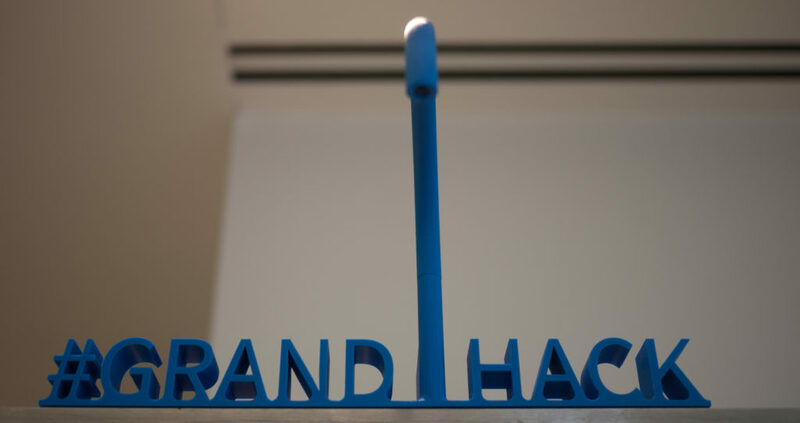 I challenged myself to build something that would encourage people to tweet more during the Grand Hack (#grandhack). 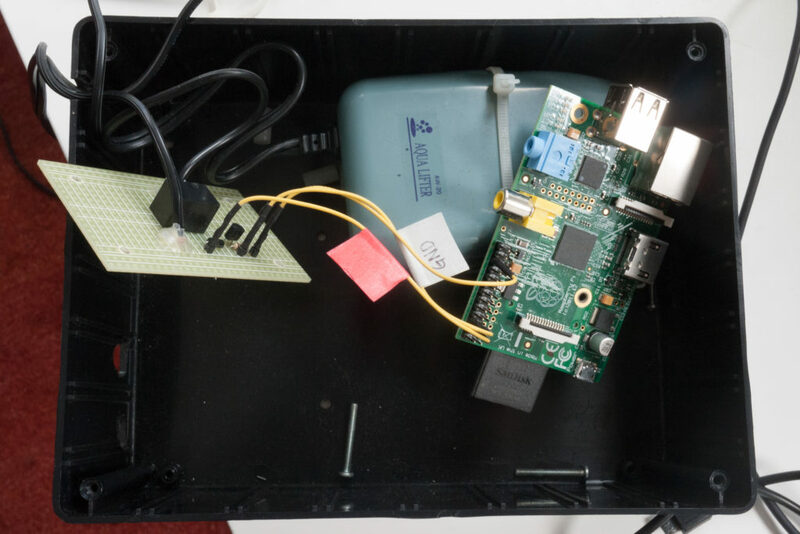 I came across a tutorial for creating a “Raspberry Pi Twitter Monitor1” and then this one for building a “Self Watering Plant2.” I put them together and voila! …the Twitter Fountain was born! 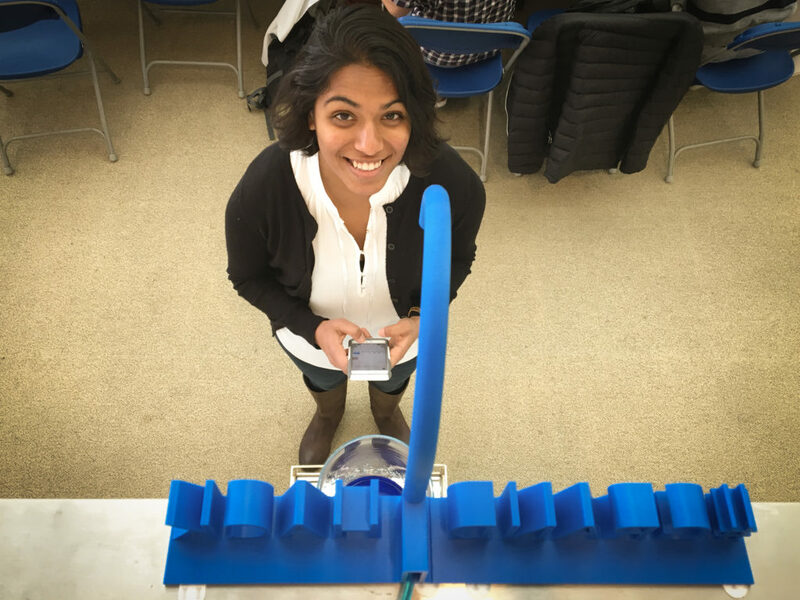 Check out a video explaining more about how the Twitter Fountain works in this 1min video from the 1st version of the fountain built in 2014: People are amazed at how quickly their tweet manifests in a real-life event (<2 seconds between pressing the ‘tweet’ button and seeing the fountain fill up). It’s cool to connect our online social media world with the physical world! 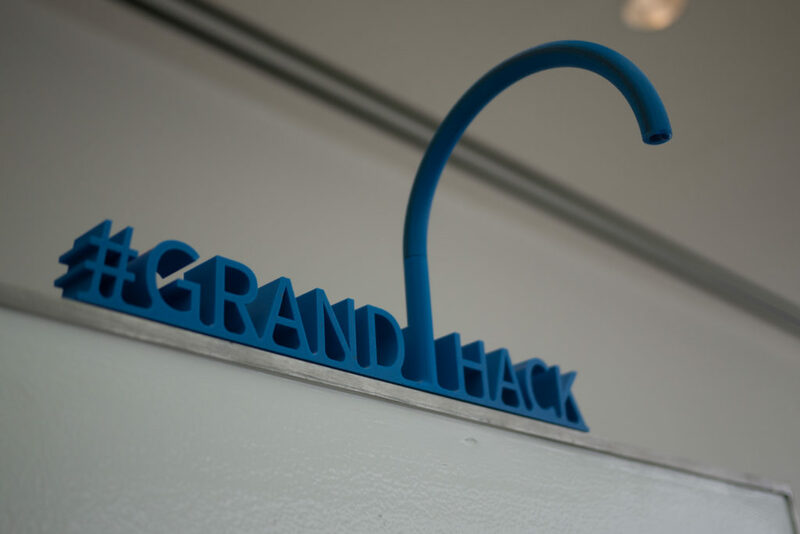 One more #GrandHack drop in the Twitter fountain. Thanks @mithackmed - it's been a great event! Much credit goes to the two tutorials1,2 that inspired the Twitter Fountain and I highly encourage you to check them out. But instead of making readers have to read and reconcile 3 different tutorials in order to build the Twitter Fountain, I will re-post content from the other tutorials here, in addition to filling in gaps where I found information to be lacking (especially circuitry details and how to use a Raspberry Pi), and adding specific instructions for the Twitter Fountain. 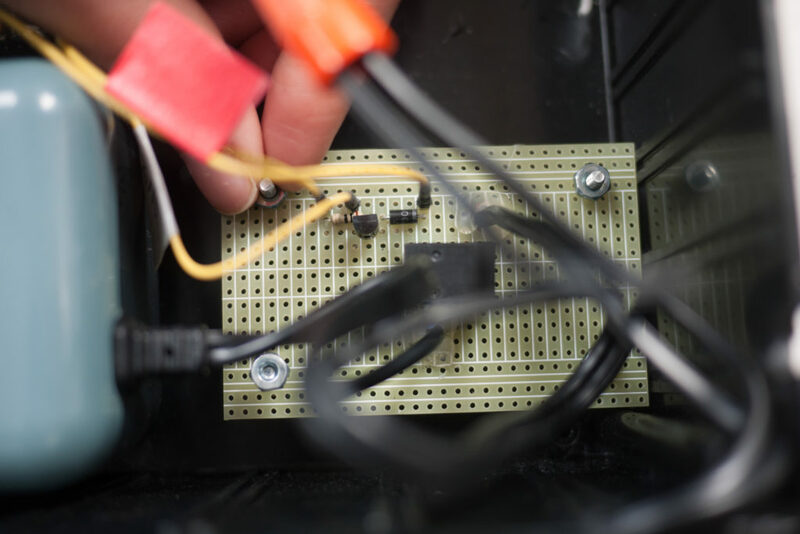 Assumptions: This tutorials assumes you know how to solder and use a breadboard but that you’ve never used a Raspberry Pi before. 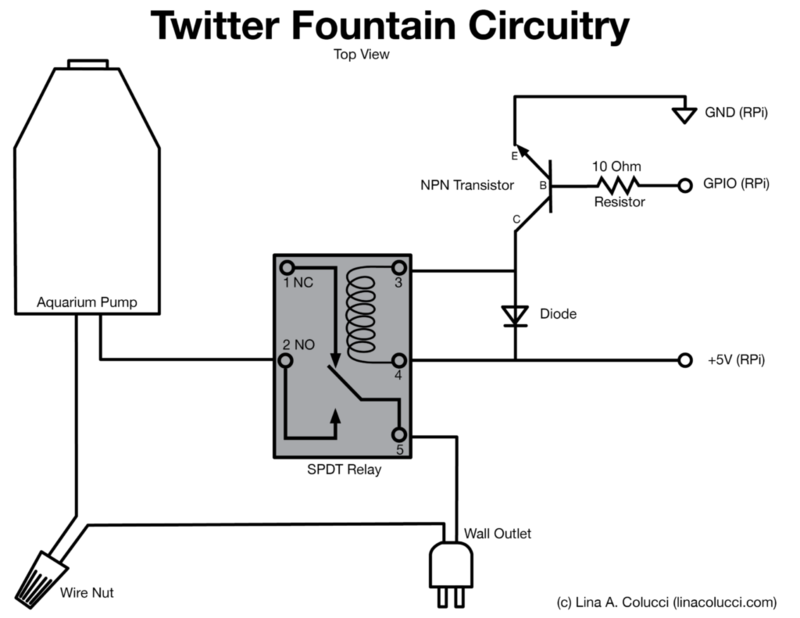 Without further ado, here are instructions on how to build your own Twitter Fountain! 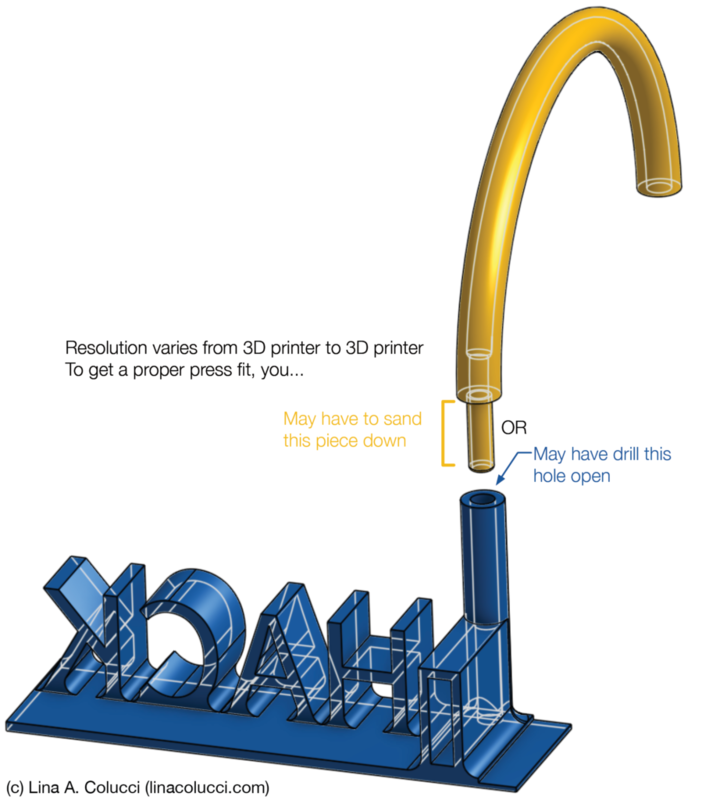 For the fountain head, you'll need access to a 3D printer OR time and money to order an online 3D print. Two online stores that you can order 3D prints from include Shapeways and Ponoko. There are others. You can improvise this based on your location and needs. At a minimum, you need a vessel to collect the water that falls the fountain (I used something like this large vase), a taller location for the fountain head and water reservoir to sit, and access to an ethernet port and outlet that your fountain can connect to. Note: this step is taken verbatim from the following Sparkfun tutorial (https://learn.sparkfun.com/tutorials/raspberry-pi-twitter-monitor/all#the-twitterverse). In order to interact with Twitter (including searching, monitoring, posting, etc. ), you will need to register your application. This is accomplished by going to https://dev.twitter.com/. 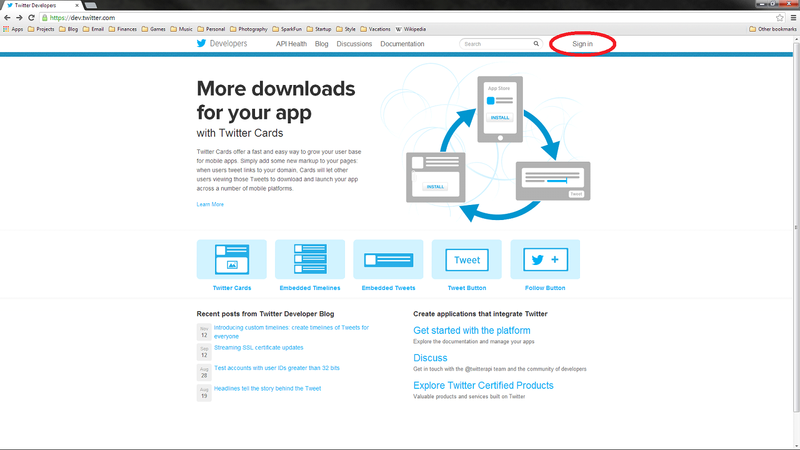 Click the “Sign In” button at the top-right of the screen and enter your Twitter credentials (you can also sign up if you don’t have a Twitter account). Once you have signed in, click on your user icon, and select “My Applications.” Click the “Create a new application” button, and you will be presented with a form to fill out about your application. Fill out the name and description fields. 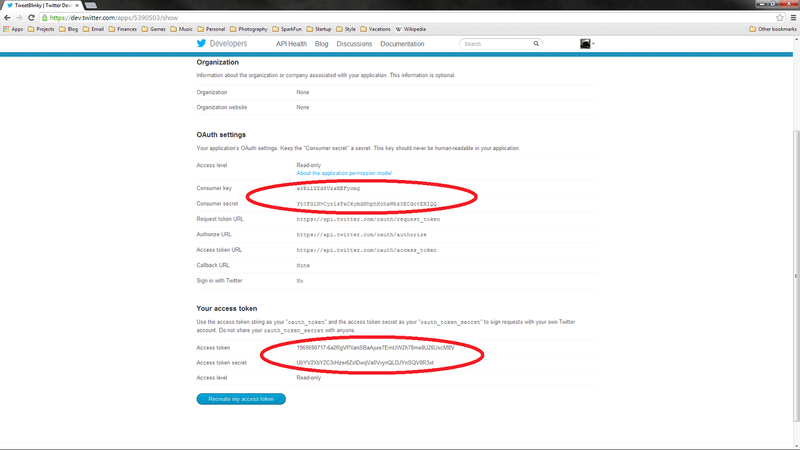 For “Website,” you can put something random, like http://github.com or something else that looks legitimate. 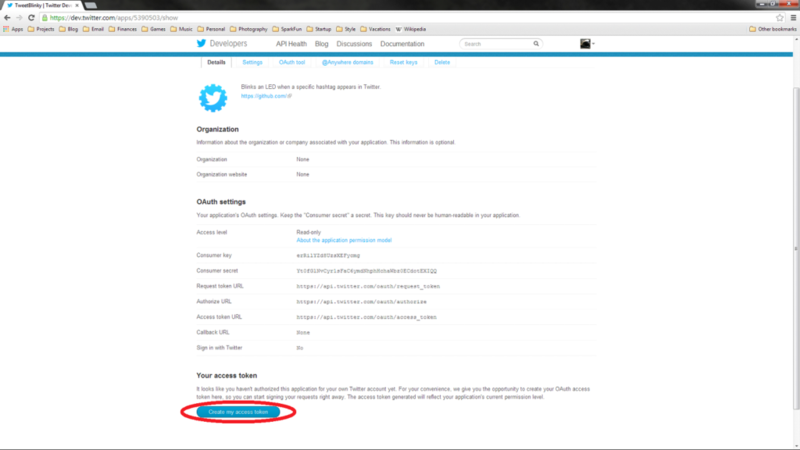 At the bottom of the page, click the checkbox to agree to the rules, fill out the Captcha, and click the “Create your Twitter application” button. Once completed, you will be presented with a dashboard for your registered application. You need to create an access token, so click the “Create my access token” button at the bottom of the screen. Wait a few seconds and then refresh the page. You should see a section titled “Your access token” at the bottom. Copy down the “Consumer key,” “Consumer secret,” “Access token,” and “Access token secret.” We will need these for our application. 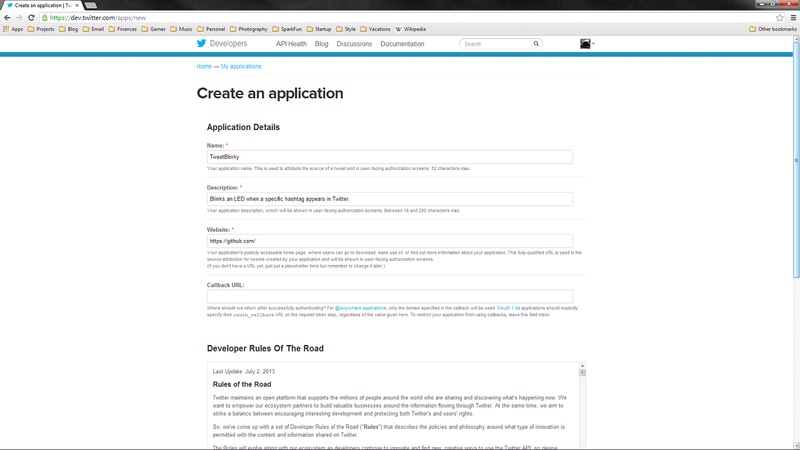 Note that we set up this Twitter application as an example. It will have been deleted by the time you read this, so don’t be trying to use our tokens! (Step 0) If you have never used a Raspberry Pi before and are looking for help getting started, follow Steps 1-3 of these amazing instructions: http://lifehacker.com/the-always-up-to-date-guide-to-setting-up-your-raspberr-1781419054 (Note: there's no need to go beyond Step 3 for our purposes). When you're at the point where you're looking at the terminal screen of your Raspberry Pi’s OS (we use Raspbian) with the keyboard (and optional, but nice to have mouse) hooked up, read on! 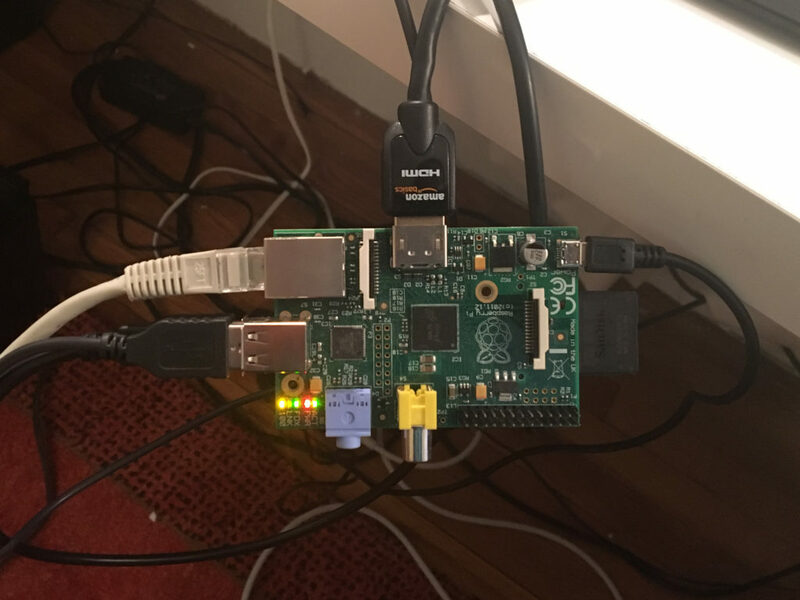 A Raspberry Pi with HDMI Monitor, Ethernet, Power Supply, and USB Mouse hooked up. 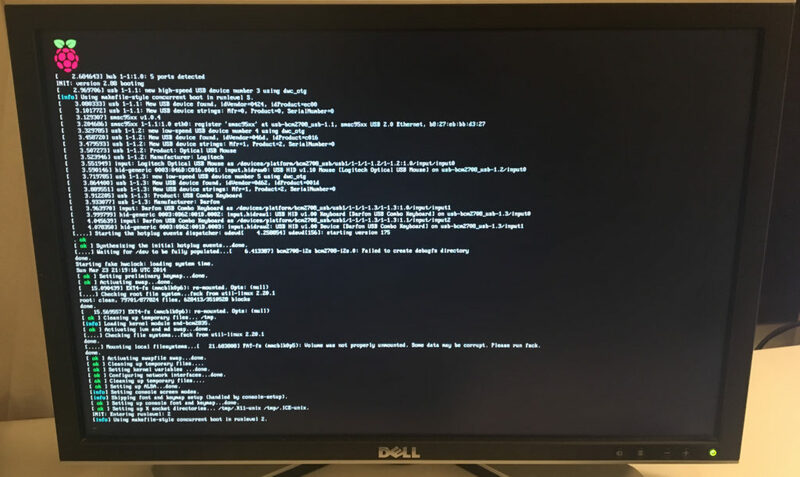 Once the Raspbian OS is installed and you plug in the power supply to the RPi, the RPi will boot up and your monitor screen will look something like this. We will be doing all our work from the terminal line (i.e. the screen looks like this and not a regular desktop). If you are looking at a regular desktop, search for an application called "terminal," open that up, and do your work there. Boot up your Raspberry Pi (by plugging in the power) and use the terminal navigate to whatever folder you want to create your Twitter Fountain program in. Important! Note that you'll have to substitute your own Twitter Authentication tokens (everything that's black and bolded) from Step 2. Right now, they are set to the tokens from the example above and are not real. If the computer says you don't have enough permission to do something, repeat the command with "sudo" typed in front. "Sudo" allows you to run things with superuser privileges. I remember the first time I installed something using the command line. It was a moment of revelation. At first I was amazed, "That's it?! It's already done??" Then I started wondering what I had been doing all my life by wasting so much time installing things from a disk image. Moral of the story, is that the terminal is magical in many ways once you know how to use it. Trim away any unnecessary plastic mounting brackets from the front of the pump that may prevent it from being flush with the case. This is the hole that the pump nozzle will stick out of. Line up the water pump with the base of one of the 6" x 3" sides of the case. 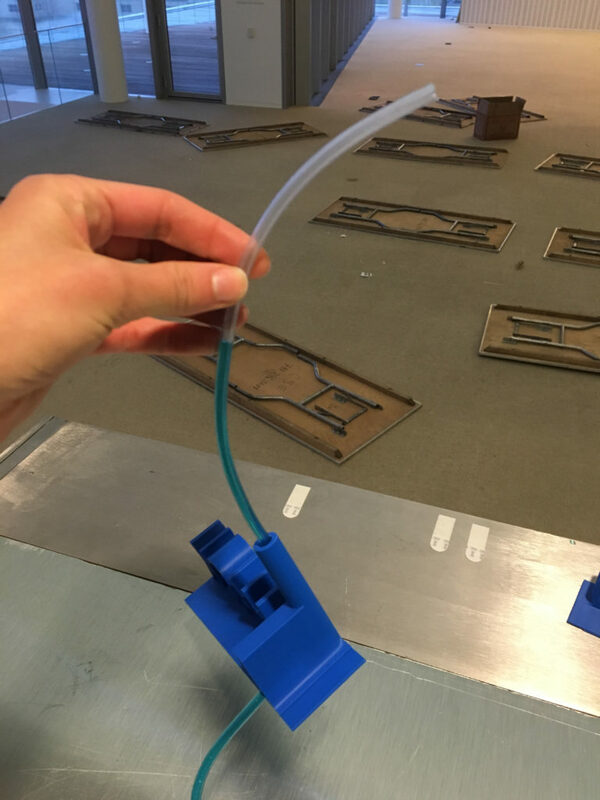 Drill or cut a hole large enough to fit the aquarium pump's nozzle through. Position the water pump, Raspberry Pi (note that a Arduino, NOT an RPi, is pictured above) and circuit board in the bottom of the case. Make marks in each of their mounting holes. The pump will probably not have a mounting hole, so just make a mark on each side such that it can easily be zip tied down. Drill all of the holes that you have just marked with a 1/8" drill bit. You may need to widen the zip tie holes to 3/16". On the 6" x 3" side of the case that has yet to be drilled, drill 3 1/4" holes. You'll have an ethernet cable, an RPi power supply cable, and an aquarium pump power cable going into these holes. Make sure you can get these 3 cables through the holes. Zip tie the water pump securely into the case. Cut the pump's power cord about 6" from the pump's body. Pass the cut power cord into the box through the 1/4" hole closest to the water pump. Split the power cord such that each conductor is its own separate insulated strand for about 6". Repeat this process for the cord going into the water pump. They need to be separated because each cable is being wired to a different spot. After you've cut the aquarium pump's cable in half, you'll have 4 different pieces of wire to work with and you should strip all 4 of them. Take 2 pieces (1 from each half) and attach them together using a wire nut. I preferred to solder the pump cables to the top of the board. 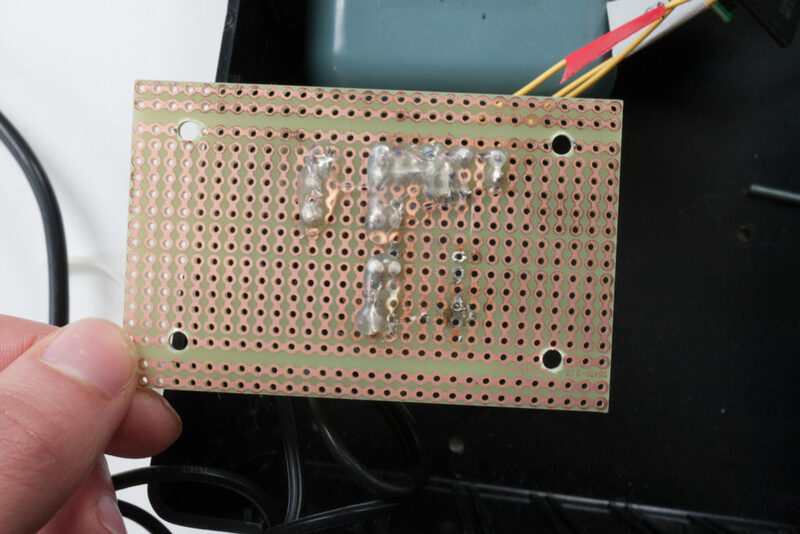 The Self-Watering Plant tutorial soldered them to the bottom of the board. It doesn't matter. I recommend adding hot glue to the top of your soldered joints for mechanical stability. 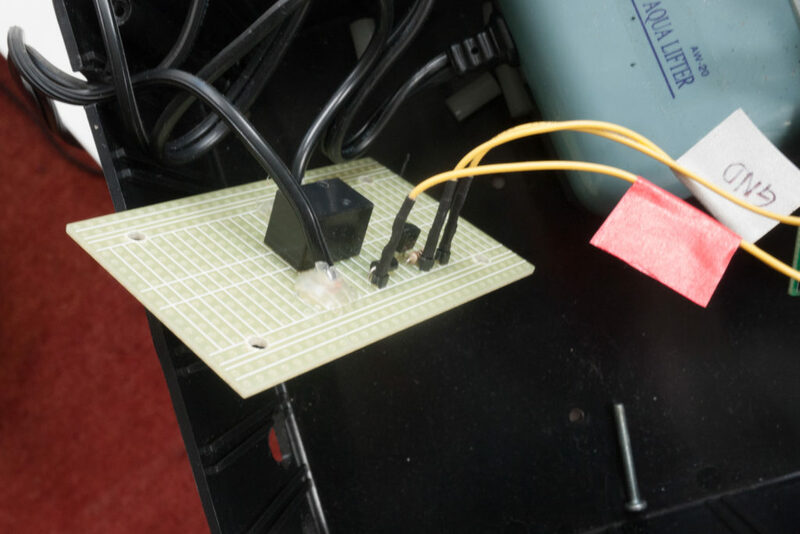 Don't do this until you are certain your circuit is working properly, however. Either label your wires or use different colors to avoid confusion when connecting to the Raspberry Pi. (Optional) After ensuring your circuit is working properly, hot glue can add mechanical stability to your soldered joints. CAUTION!!! Water and electronics do not mix well! Be extremely careful to not get water on your circuitry. 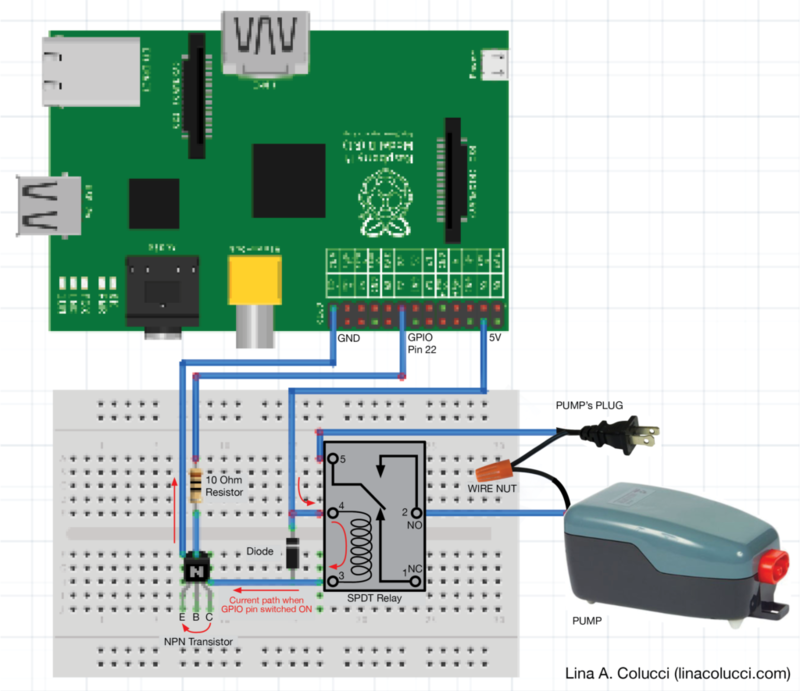 Once all of your connections are made both on the circuit board and the Raspberry Pi, test out that the electronics are working. Power up your RPi, navigate to the folder with your TwitterFountain.py script and type "sudo python TwitterFountain.py" on the command line. 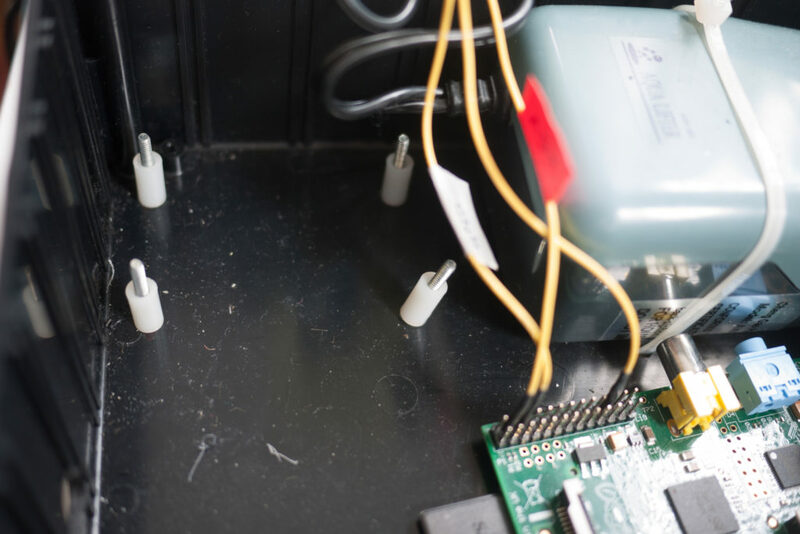 You should see the tweets pop up on your terminal screen, you should hear an audible click of your relay every time a new tweet appears, and (if you've gotten your pump tubing hooked up) you should see water moving through the tubing with every tweet. You'll see that I first prototyped the system on a breadboard, which is a great strategy to make sure everything is working before committing it with official solder. Attach the circuit board to the project box using 1/4" spacers, nuts and bolts. 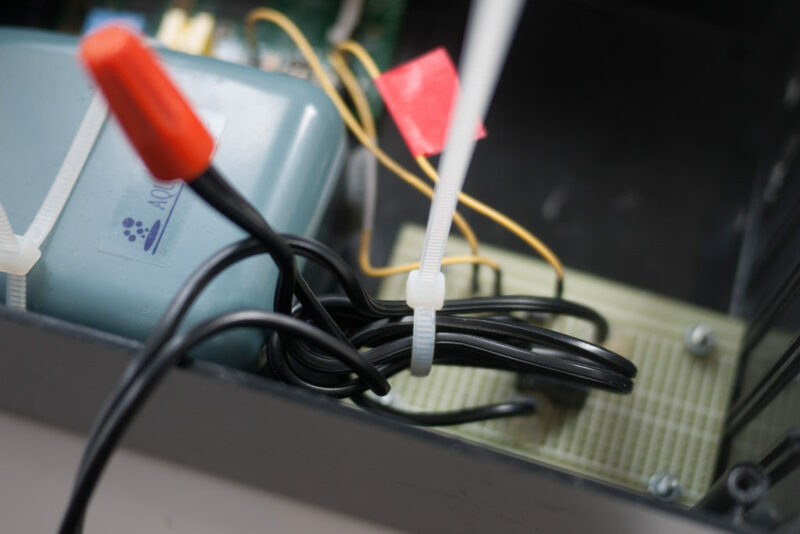 Bend back the power cable on the inside of the box and cinch it in place with a zip tie to keep things tidy and prevent the cable from being pulled back through the outside of the box. If you haven't already, cut the tubing in half. Plug a tube into each of the pump's connector valves. Close up the box. You are done with 90% of the Twitter Fountain! Now onto the creative portions... the fountain head and assembly. 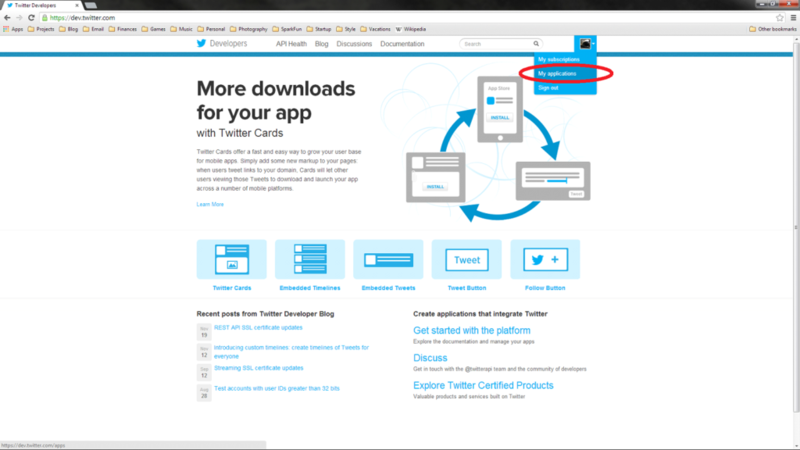 There are many possible ways to set up your Twitter Fountain depending on your space. If you are using a ledge with a vase collecting water beneath it, you'll need some sort of structural support to hold the floppy tubing. 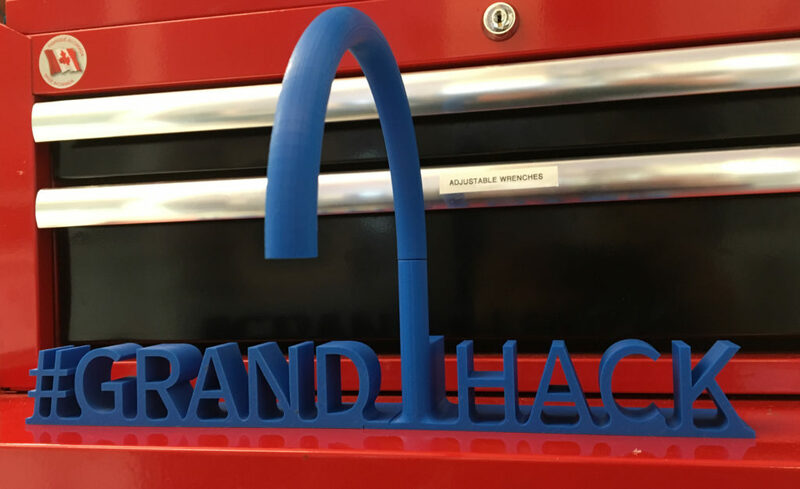 I made a 3D printed fountain head with the event's hashtag: #GRANDHACK. Here's how you can make your own! I decided to try OnShape - the first and only full-cloud 3D CAD software - for this project and it is unbelievable! (I mostly used Solidworks and a bit of Rhino before). All you need for OnShape is an internet connection. 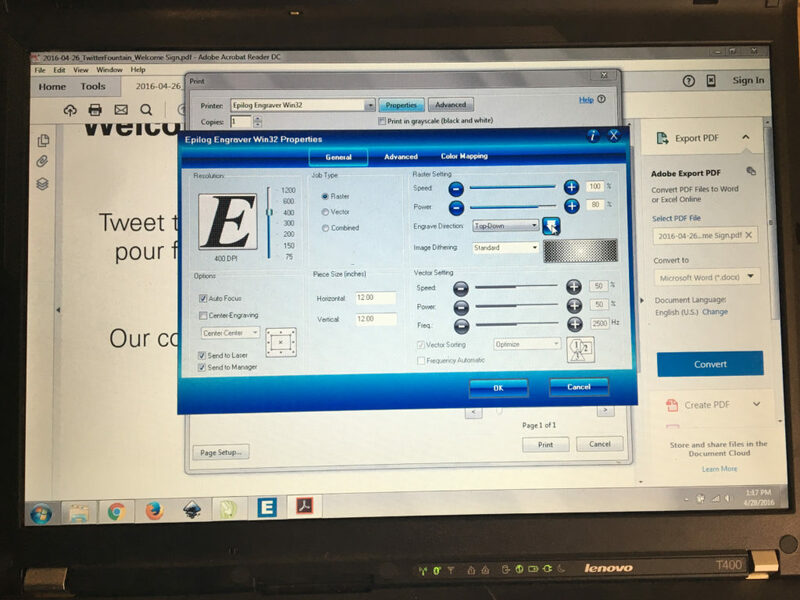 You just open up a browser on any device, go to www.onshape.com, and you have a full CAD suite at your fingertips. Doesn't matter if you are on a Mac, PC, Linux, tablet, iPhone, or anything else. Say goodbye to massively long installation times! There's no need to install anything with OnShape. OnShape automatically saves your documents as you go (no more losing hours of work because you forgot to save or because Solidworks crashes for the umpteenth time). OnShape also automatically does version control so you can easily go back to what your part looked like at any point in time. Beautiful. I have not used OnShape with a team yet but one of the great benefits of OnShape is that teammates can work simultaneously on the design or on different branches (Github brought to Mechanical Engineering!). OnShape was created by the creators of Solidworks who realized that CAD software has not evolved much. 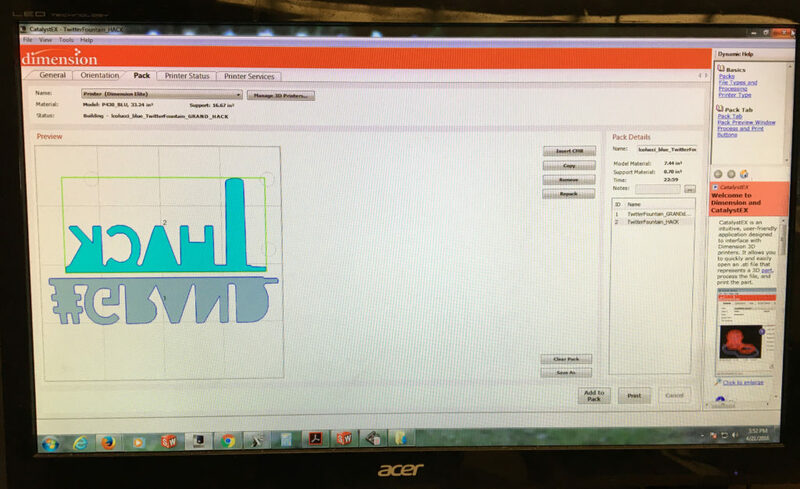 Cloud CAD is the future and the future looks mighty fine. 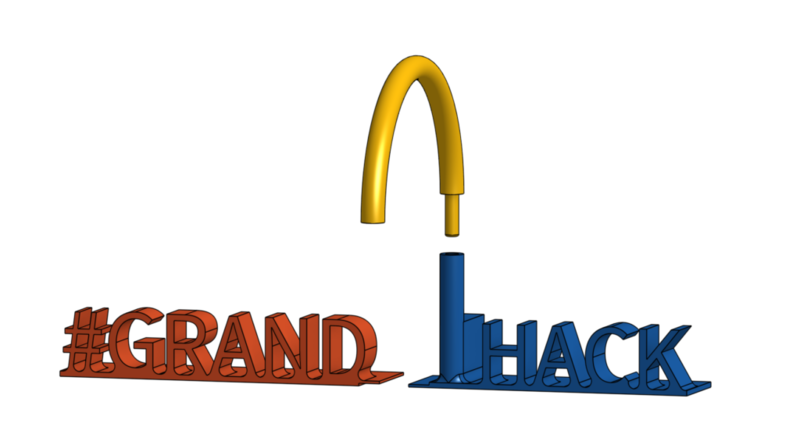 If you couldn't already tell, I highly recommend OnShape (and I'm not getting paid for this). In addition to being amazing, it's also FREE! So anyone can get started using OnShape immediately. Here is the file for my Twitter Fountain fountainhead. You can 3D print it for your own fountain. Feel free to modify my design or start from scratch. Twitter Fountain CAD File: https://cad.onshape.com/documents/58115efe66ec9a10683b9825/w/31ec3ae5e757342b118c3214/e/09e82a3ea870ba624bc0c15e Note: I made a mistake in my original fountainhead design by not making the connection point between the fountain tube and the HACK piece wide enough for the aquarium pump tubing to pass through. I fixed this issue in the part I've linked to. However, I have not 3D printed this new part to verify my improvement actually works. If you print it out, please leave a comment letting us know how it works - thanks! FYI: Since the resolution of each 3D printer is different, I did not attempt to properly size the press fit of these two tubes. Their diameters are equal and so you will have to do some sanding or drilling to get the press fit just right. Thank you! A huge thank you to Mark Belanger and Oksana of the Edgerton Shop for their help with designing and printing the fountainhead. The Edgerton Shop is one of my favorite parts of MIT mostly because Mark and Oksana are phenomenally helpful, knowledgable, and wonderful people. If you don't have access to a 3D printer, there are many online stores that where you can order 3D prints and have them mailed to you. Options include Shapeways, Ponoko, and others. I have not personally used any of them. 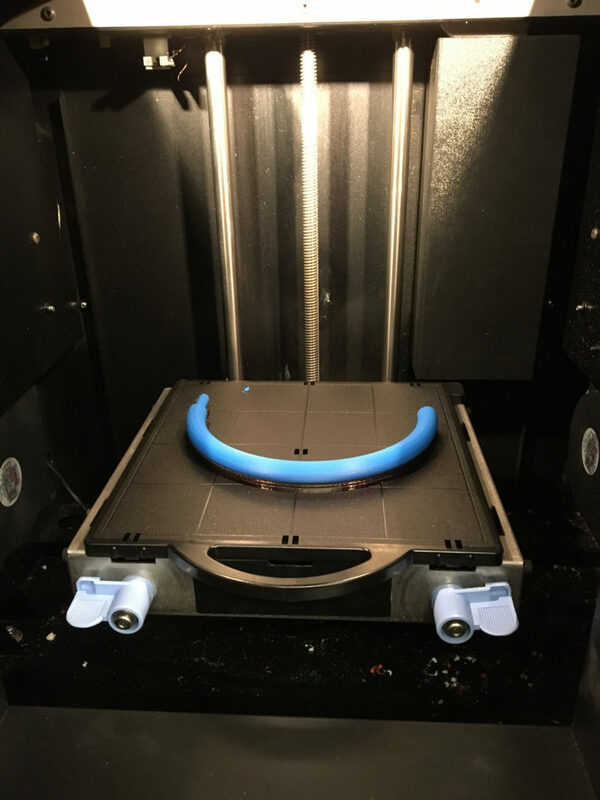 Setting up the 3D prints: The tube after 3D printing is completed. Enlarging the hole a bit for a nice press fit. The completed fountainhead hot off the (3D) press! 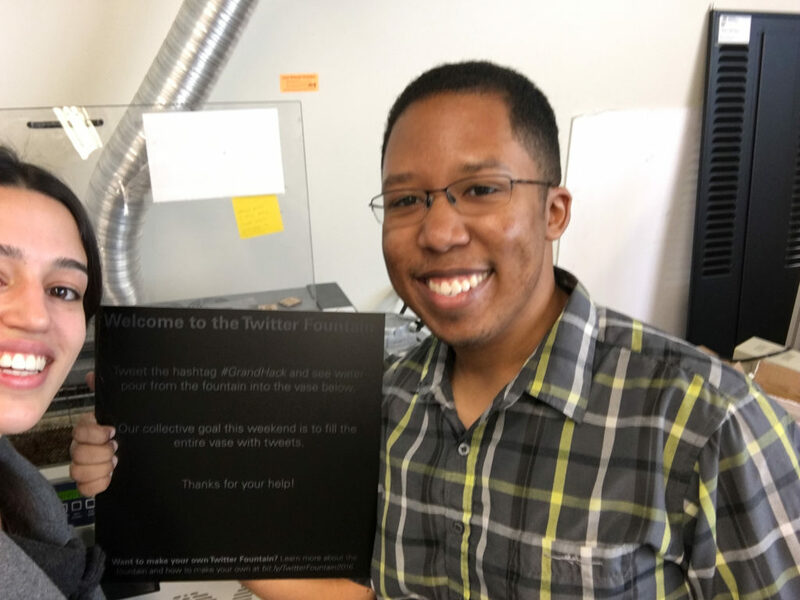 I laser-etched a piece of anodized aluminum to make a nice-looking sign to hang in front of the Twitter Fountain. Thank you! A very big thank you to Marcel Thomas for his help making this sign! Marcel is an all around boss at making things and you can check out a sample of his work here: http://web.mit.edu/mact/www/index.html. Here is the aluminum I used: McMaster Carr 6062K21 (I tried both silver and black) Here is a pdf of the sign: Welcome Sign Here is a 30sec video of the laser etching: Here are the settings we used on the laser cutter for etching this. It worked really well. The main thing we learned is to make sure the piece of aluminum is completely flat, otherwise the etching will look uneven. Lay down a weight if necessary. Voila! You are done! You just have to put all these parts together in your chosen area for display. Please let me know if you make your own Twitter Fountain or something different that was inspired by this. I would love to know about it! This tutorial is licensed under a Creative Commons License. You may copy the materials here for any purpose but must giver proper attribution. Colucci, Lina A. Twitter Fountain. 2016. www.linacolucci.com This work is licensed under a Creative Commons Attribution-ShareAlike 4.0 International License. 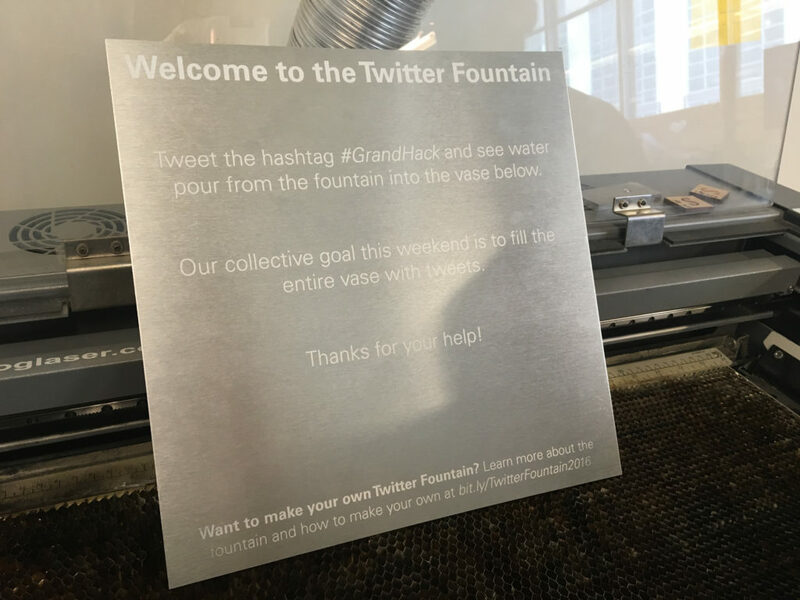 Description: I invented a Twitter Fountain – a fountain that pours water into a big vase every time that someone tweets with our event’s hashtag. The goal was to stimulate tweeting in the virtual world by making the tweets manifest themselves in the physical world. The Twitter Fountain has delighted attendees at two 500-person conferences!